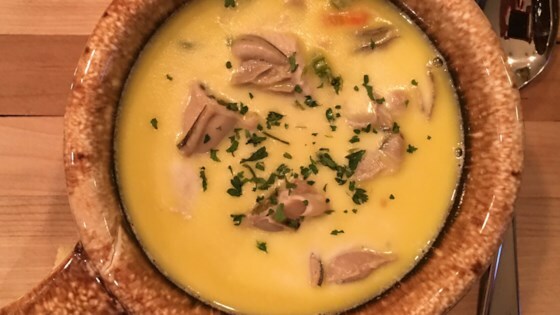 "This is best Oyster Stew you ever had! It is elegant and satisfying. I serve it with toasted homemade bread. Serve it quick and hot! Try adding a drop or two of hot sauce in your stew -- it's delicious!" This is oysters in milk and not very good. I added a lot of cornstarch to try to thicken it up and it didn't work. Not worth the trouble. I made this for my dad. He has eaten a lot of oyster stew in his 77 years and he says this is the BEST oyster stew he has ever eaten. It's amazing how something so simple can be so delicious. This turned out so well. Since I'm in MN I used canned oysters. I grew up on them in my oyster stew, so I figured it would be fine. The taste is fabulous. Quite honestly I was looking for a recipe that stacked up against my mother's in my memory. This one did!